Several million years ago, the continent of Antarctica has become covered in ice. Their lies the great city of the Ancients, Atlantis — but no longer. One Ancient bids a solemn farewell to another, who will stay behind. The great city lifts off the surface and flies away like a great ship, leaving behind only a small outpost and the woman, who scientists will discover frozen in the ice millions of years later, and name “Ayiana” (“Frozen”). In the present day, an international expedition has been set up on the same site to study the outpost of the Ancients and the technology therein. It is headed by Dr. Elizabeth Weir, recently transferred from Stargate Command. Also present are Canadian astrophysicist Rodney McKay, Scottish medical doctor Carson Beckett, British scientist Peter Grodin, and many others. Dr. Daniel Jackson is also there, and eagerly reports his findings to Weir and McKay: He’s found a Stargate address to the Ancients’ lost city itself — Atlantis — which is now in the distant Pegasus Galaxy. Brigadier General Jack O’Neill heads toward the Antarctic base in a helicopter piloted by Major John Sheppard, who is stationed at the nearby McMurdo Air Force Base and who knows nothing about Ancients or Stargates. But when Dr. Beckett accidentally activates an Ancient drone weapon — he possesses the rare gene that allows him to use the base’s chair control mechanism — Sheppard must take evasive action to keep from being shot down. The weapon is disabled in the nick of time, and Sheppard and O’Neill arrive safely (if not a bit cranky) at the outpost. Daniel explains his findings to the General, who does not approve an exploratory mission to the lost city when he learns that it will take their only Z.P.M. — Zero Point Module, the Ancient power source that has enabled the outpost and saved Earth from the Goa’uld — to dial a Stargate address beyond our galaxy. Weir and Jackson manage to convince him, though, based on the great wealth of Ancient technology (including more Z.P.M.s) that they are likely to find should they discover Atlantis intact. 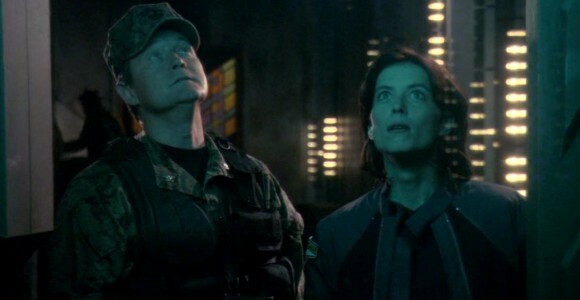 The mission is a go, and Weir’s team of international scientists and military personnel — which she has been assembling for months — arrives at Stargate Command, deep inside Cheyenne Mountain. Daniel is disappointed that he cannot go with them, especially when a wormhole to Atlantis is successfully established. Dozens of men and women and tremendous amounts of equipment file through the gate, knowing that because of the massive power requirements they’ll probably only get one shot at it. They are all volunteers, the best and brightest that Earth has to offer, who go knowing full well that they may never be able to return home. Even the reluctant Major Sheppard, after some convincing by O’Neill, has agreed to go. Weir wants him there, despite a black mark on his service record for disobeying orders to save the lives of fellow servicemen, because Sheppard too possesses the gene that allows him to use Ancient technology. While some, like Beckett, and learn to use it with concentration and training, for Sheppard it’s easy and instinctive. The team is lead by military commander Colonel Marshall Sumner, who is the first to step through to Atlantis. The facility is cleared and secured, and remarkably the systems begin to activate and light up as the humans begin exploring the massive city. Two scientists find a bay filled with Ancient ships capable of traveling through the Stargate; Dr. McKay finds the control room with Stargate dialing controls; and it’s not long before the team discovers that the entire city, protected by a massive energy shield, is underwater. As they continue to explore, Beckett finds a holographic recording left by one of the Ancients. She explains how the Ancients left Earth and came to the Pegasus Galaxy, seeding the human form of life on a thousand worlds. But then they set foot on a dark world where a terrible enemy slept: the Wraith. The enemy awoke and began feeding on the human-populated worlds like a great scourge, until only Atlantis remained. The shield withstood the assault of the enemy’s weapons for many years, but finally the Ancients decided that the only way to preserve the last of their kind was to submerge the city. The remaining Ancients went through the Stargate and returned to Earth thousands of years ago to live out the remainder of their lives. Soon, however, the team realizes that the great city of the Ancients may be nearing destruction — and because of their arrival. Two of the three Z.P.M.s that power the city are dead, and the third is almost there. By exploring the city and turning things on, they risk the complete failure of the shield that is holding back the ocean. The naquadah generators brought from Earth cannot generate nearly enough power to sustain the failing shield, and, as expected, there’s not nearly enough power to gate back to Earth. But they can dial to other planets in the Pegasus Galaxy. A planet from the Ancient’s local database is chosen, and Colonel Sumner leads a team to either find a new Z.P.M. or safe harbor for the expedition. Major Sheppard goes along, as does the young and enthusiastic Lieutenant Ford. They arrive in the dark on the planet Athos, where two young children are playing in the woods. They meet a man named Halling, who believes they are traders. Halling leads them back to the Athosian encampment and introduces the team to Teyla Emmagan, one of their leaders. She is a strong and beautiful woman, who is cautious about helping the strangers. Sheppard tries to get to know her. When the sun comes up it reveals the ruins of an old city nearby, which the Athosians do not visit for fear that it will bring the Wraith down upon them. Sumner leads a team to check it out, while Teyla shows Sheppard a series of cave drawings that tell of the last great Wraith attack on their world. The Wraith keep human-colonized worlds like Athos as feeding grounds, returning every so often to “cull their human herds” — though sometimes not for hundreds of years at a time. Still, they return more frequently in smaller numbers to keep the Athosians living in fear. Though they possess advanced technology, the Athosians live as a simple people and move their camps around to try and avoid the great enemy. Teyla is surprised to hear that the visitors have never heard of the Wraith; they have visited many worlds through the Stargate, and have never met anyone who did not know about them. “Rising” had a production budget of $5 million (U.S.) for the complete two-parter. Stargate Atlantis was originally conceived to be set on Earth, after SG-1 had ended its run and spawned the new series with a feature film. The film’s story instead became the SG-1 Season Seven finale “Lost City,” which set the stage for the new show. Because SG-1 continued on to an eighth season, which ran simultaneously with the first year of Atlantis, the producers decided to instead set the new show in another galaxy, so that both shows could run simultaneously without their plots interfering with one another. Elizabeth Weir, first created for Stargate SG-1‘s “Lost City,” was originally “Teresa Wright,” then “Teresa Weir.” The same character was played by actress Jessica Steen in the SG-1 Season Seven finale. Teyla was originally named “Mikala” in an early draft of the script. Among the many actresses who auditioned for the role is Ona Grauer (“Ayiana” in SG-1‘s “Frozen”) and Kira Clavell (“Amaterasu” in SG-1‘s “New Order”). VOTE! How would you rate Atlantis's "Rising, Part 1?"